To The Batpoles! Batman 1966: #073 Frank Gorshin returns - Don’t blink or you’ll miss him! #073 Frank Gorshin returns - Don’t blink or you’ll miss him! Frank Gorshin returns for one more round as the Riddler. Is he as good as ever, or down for the count? Does Joan Collins' appearance as Siren steal Gorshin's screen time? 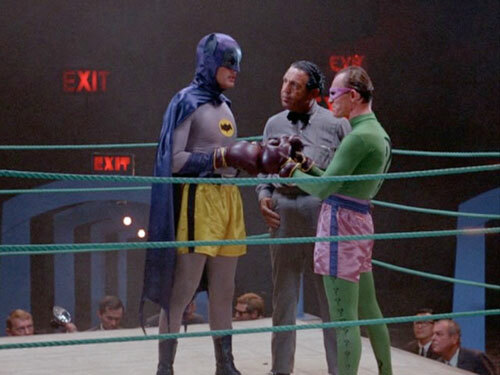 Is Riddler's alias Mushi Nebuchadnezzar meant as a Muhammad Ali reference? Is Batgirl way smarter than the Dynamic Duo, or is she just written that way? In our Camping Trip, Paul notes how the brisk pace of season three episodes has abbreviated the camp moments as well. Also, in the Bat Research Lab, we look at a late-'70s take on the '66 show from Gary Gerani's book "Fantastic Television." Plus, a metal version of Hefti's Bat-theme from 331 Erock, and your mail!